While Malaysia’s Nicol David celebrated a remarkable fourth Squash gold medal in the 17th Incheon Asian Games in the Republic of Korea, it was a historic first gold for Kuwait when underdog Abdullah Al Muzayen recovered from 2/0 down to topple top seed Saurav Ghosal in the men’s final at the Yeorumul Squash Centre in Incheon. 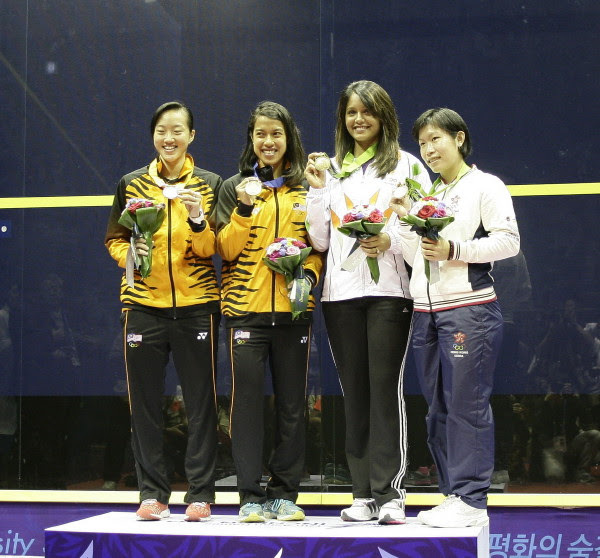 Nicol David, who has topped the women’s world rankings unopposed since August 2006, won her first Asian Games gold medal in Thailand in 1998 – aged just 15 – then triumphed again in 2006 in Qatar and 2010 in China. In her fifth successive final, but the first all-Malaysian, the 31-year-old from Penang recovered from a game behind to beat fellow Penangite Low Wee Wern, the No2 seed, 9-11, 11-6, 11-5, 12-10 in 60 minutes. Al Muzayen was making only his second appearance in the Asian Games after reaching the quarter-finals in 2010. The 26-year-old 5/8 seed began his giant-killing Incheon run in the quarter-finals, beating Malaysia’s 3/4 seed Mohd Nafiizwan Adnan before removing Hong Kong’s second seed Max Lee in a 75-minute semi which went the full distance. In his first victory over Ghosal for more than six years, the Kuwaiti left-hander fought back from two games and match-ball down in the third to beat the world No16 from India 10-12, 2-11, 14-12, 11-8, 11-9 in 87 minutes. 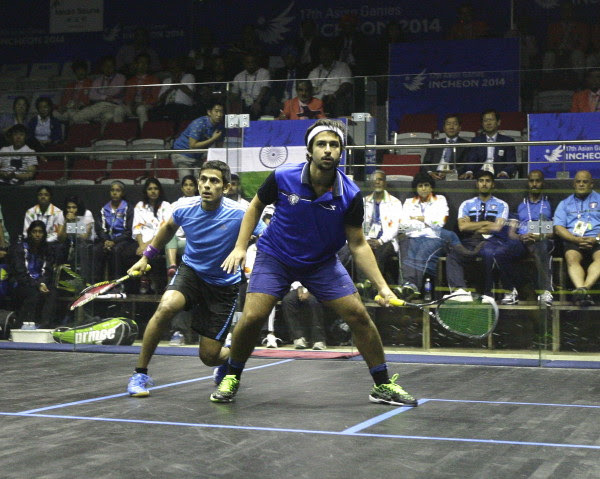 “It was a tough match for me,” the world No46 (pictured above in action with Ghosal) told Inside The Games afterwards. “When I was down two love, I said to my coach that I’m done.